I rarely work the day shift. It is nice to be able see daylight when I go outside on break. I found this make-shift bicycle rack. I think the bike is locked to the gas pipes that supply the cooking equipment within. I suppose the bicycle belongs to the chef. 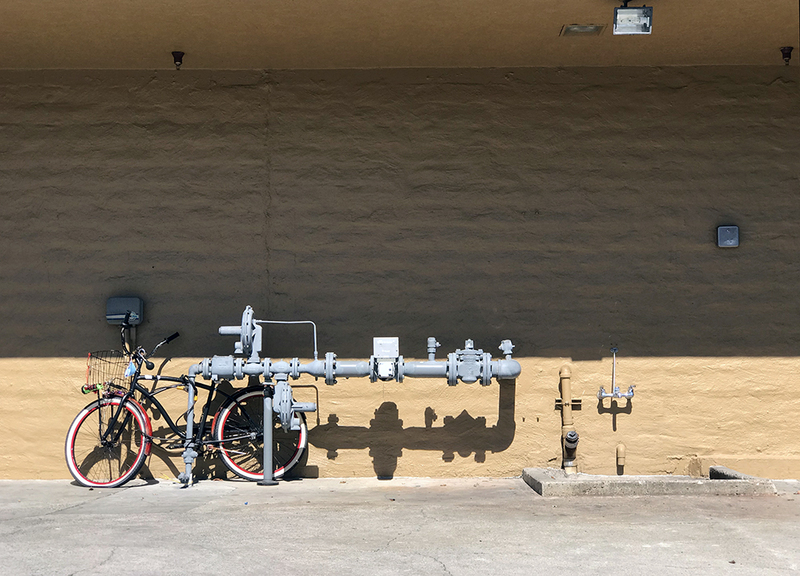 This entry was posted in Personal Stories and tagged artistic process, bicycle, bicycle rack, creative process, creativity, gas pipe, photography, street photography, visual arts, watercolor. Bookmark the permalink. The effect of shadow and light, truly stunning. Thanks again, Sue! I like that the shadow shows another dimension of the object that casts it.